Home Apple and iOS A $1,000 cell phone is insanity. This is obnoxious. Not necessarily that the iPhone is insanely overpriced for what it offers, but that the media is seriously advocating people go into debt to finance a cell phone. Don’t get me wrong, I’m not saying cell phones have not nudged their way from superfluous almost over the line of necessity, I’m just saying that there is no reason to go into debt to own a thing that you could literally purchase a rough equivalent to for around the low, low price of about $550, and that’s not even hunting for a deal. Phones are far more expensive that most people have realized in the past 10-15 years. With the mobile carriers duking it out in the decades following Ma Bell’s disillusion, consumers were landing $4-600 devices for often under $199. This was going on at the same time that these newly abandoned pieces of the formerly formidable AT&t were cannibalizing each other and fighting for subscribers. These fragments of the previous company were broken up geographically and soon these regional carriers grew into the other’s’ territories. This fierce competition gave everyone the cell phone boom that erupted around the time of the first Moto Razr, when Cingular and AT&t were remerging with each other. More recently these carriers have consolidated themselves and the dozens of carriers that provided consumers with choice and competition have consolidated into four basic carriers. AT&T, Verizon, Sprint, and T-Mobile, with Sprint and T-Mobile doing what they can to tie the knot. This would bring the number of carriers in the US down to three major players, who by their own size and subscriber count, can begin to do what monopolies do best: Dictate the terms of business to everyone else dealing with them, instead of the reverse. Now AT&T and Verizon are forcibly taking things promised to us, the consumers. Where are our unlimited plans? They stole those from us, all the while complaining about their bandwidth. After doing away with unlimited plans, then came the price increases for data plans. When greed and lust for money could no longer be satiated by attacking the monthly billing, they took device subsidizing away. No longer could we simply sign a two-year agreement and promise our business to a provider and get rewarded with a discount on a sweet device. Now they claim to be on your side, allowing you to upgrade your device whenever you’d like! Sounds great, except now instead of a 200$ phone being subsidized, we have ever increasing hardware costs being “financed” by the providers. “But Matt, they charge very little interest on financed phones, less than a credit card or bank!” Yeah, but there is absolutely nothing from stopping their raising that interest rate on you. Especially once they’ve lulled you into the pattern of get device now and pay for device every month along with my phone bill. This is a complete 180 degrees from competition and consumer advocacy. The consolidation of telecommunications businesses has, once again, created a detrimental market to the continued development and competitiveness to the world communications market. Americans are being offered substandard service and no longer receive the device benefits that were previously exclusive to our country. If we had nationalized telecom and carriers were simply offering varying services and devices, I’d be more okay with this arrangement. This is how most countries run their wireless networks. Unfortunately we’re getting the worst of both worlds and being told that we’re lucky. Sound off people! Are you paying $1,000+ for a cell phone? 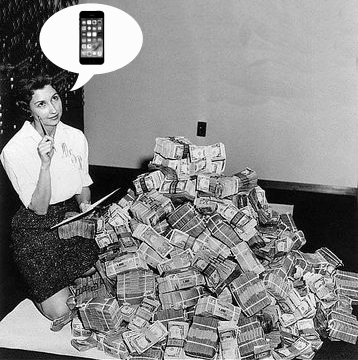 Are you financing said $1,000+ cell phone, causing it to cost you more money? And most awful, are you doing all this while being shafted by your preferred telecom provider? Not I, with my unlocked 920 and month to month AT&T service. Previous articleCell phones, wills, and suicides! Oh my! Next articleFoldable Phones? You can have my headphone jack. Totally agree. I used to be the guy standing in line at best buy (search the site there is picture proof) to buy the newest device at launch to now just buying a new device when absolutely needed or when there is some new features that I have to have. (Apple Watch 3). But I agree the Apple iPhone X has reached the insanity level. Apple waiting to get into “phablet” market and did so with gusto and a breathtaking premium which began setting the higher benchmark pricing. My wife battled me about getting a plus and when she did there was no turning back. Ipads sit and collect dust. So with so much mileage being put on phones they are wearing out faster and forcing consumers to by more. And this AT&T Next plan which is really an interest free loan eliminating AT&T from subsidizing the $199.99 on every phone was brilliant. My cell phone bill has never been higher. Kudos AT&T. I cancelled my land line, premium cable channels now what? Maybe I can stop eating as well so I can NEXT the iPhone X.